One of the main benefits, we don’t have to take impressions for invisalign or crown & bridge work. No more chunky impressions and no gagging! For braces we can take a scan and generate an image of what your smile will look like after treatment. You can then decide if braces are right for you. The scan is much more accurate than standard impressions. Meaning your treatment is much more accurate. And because the scan is digital, the turnaround time for treatment is much faster. Dental Crowns Can Be Used For Broken Or Heavily Filled Teeth That Aren’t Going To Last! They can also be used to even out your smile and the shape of your teeth. There are different types of crown available and we will always take the time to figure out what is best for you. Porcelain crowns are going to keep your smile looking completely natural – no one would even know that the tooth wasn’t your own! They are mostly used for the teeth that may need to replaced in the front of your mouth. Crowns (or caps) are used to protect and restore teeth which are damaged. They are often used over teeth that have experienced large amounts of decay and can no longer hold a filling and can be used after a tooth has undergone a root canal treatment to protect what is left of your treated tooth to ensure that you continue to have a smile that is functional. 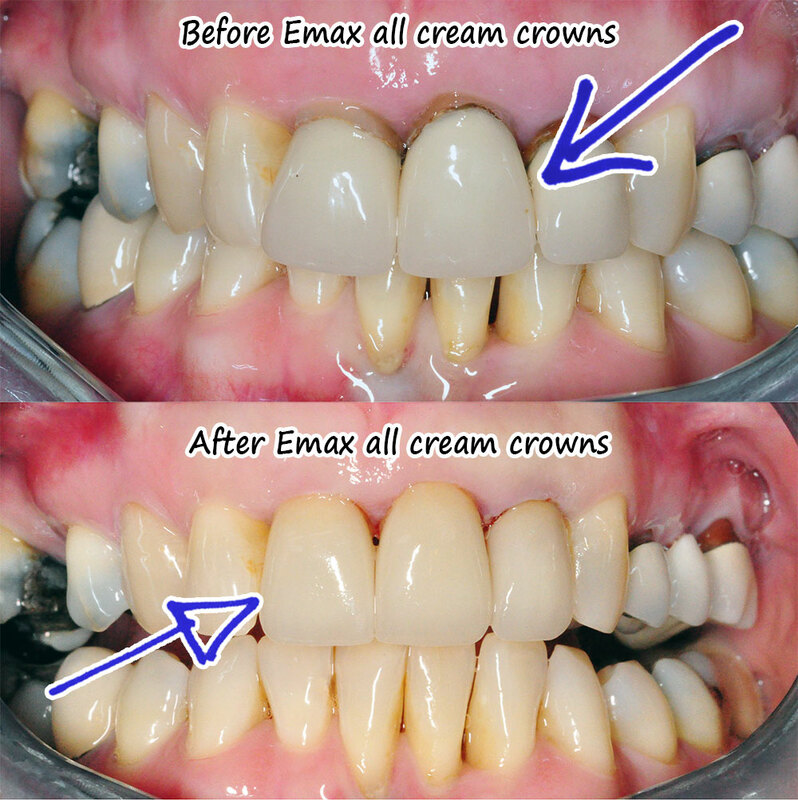 Crowns can be used cosmetically to improve the appearance of your smile and in some cases make it straighter too. This patient was delighted to get rid of her upper removable partial denture and opted for upper porcelain bridge. She “hated the feeling of having a denture in her mouth” and was “self-conscious”. Now she’s “delighted to have to wear a denture” and “so happy with her new smile”. Dental bridges literally bridge the gap between one or more missing teeth. A bridge is made up of two or more crowns for the teeth on either side of the gap. These two or more anchoring teeth are called abutment teeth and a false tooth is placed between. These false teeth are called pontics and can be made from gold, alloys, porcelain, or a combination of these materials. Dental bridges are supported by natural teeth or implants.